Pets Carry Wide Range of Chemical Pollutants What if you stretched out on stain-resistant carpet and then licked yourself? The average dog harbors at least twice the level of a type of chemical pollutant found in people. A new report has found a wide range of industrial chemicals in household cats and dogs. Your cat probably has more mercury in its system than you do, and your dog has twice as much of the chemicals found in stain-resistant carpets and couches. That's the conclusion of an environmental group that tested pets for a wide range of industrial chemicals. If you walk on a stain-resistant carpet, you may kick up and inhale a tiny dose of perfluorochemicals, or PFCs. But what if you stretched out on it for a while and then licked your fur? That's what Richard Wiles and his colleagues at the Environmental Working Group wanted to know. "It occurred to us that no one had actually tested pets, [which] live in the same environment as we do, for the toxic contaminants that we know are in people," Wiles says. The group — a nonprofit research organization based in Washington, D.C. — took samples from several dozen healthy dogs and cats at a clinic in Mechanicsville, Va. Though it was a small sample size, Wiles says lab tests revealed a number of chemicals, including Teflon compounds for stain resistance, flame retardants found on furniture and mercury, which might come from cat food. Levels of some chemicals, such as phthalates (found in plastics) and lead, were lower in pets than in people. But dogs had more than twice the levels of stain-fighting PFCs as people. In cats, mercury levels were five times those usually found in people. And levels of flame-retardant polybrominated diphenyl ethers, or PBDEs, were 23 times higher. Wiles says the findings suggest that pets could serve as a warning system for people. "It's the canary in the coal mine, if you will," he says. "They're picking up the same chemicals that we're exposed to, they have shorter life spans and they develop diseases more quickly, and so they may be providing some insight into human health problems from these same contaminants in our homes." But only if the chemicals are making pets sick. So far, there's not much evidence. One exception is a study done by Larry Glickman of Purdue University, who was trying to explain an epidemic of thyroid disease in cats. His research showed that the disease correlated with high consumption of canned cat food. Glickman suspects the culprit is a chemical called bisphenol A, a component of the resin that lines metal cans. But, to know for sure, scientists would have to deliberately expose cats to the chemical. Glickman says those experiments are expensive — and upsetting to some people. But he hopes they'll be done anyway. "While I'm not a proponent of ... experimenting on dogs and cats," Glickman says, "sometimes very small experimental studies can tell us a whole lot more and answer questions that you just cannot do by studying cats and dogs in the home." 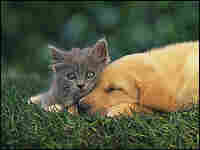 The Environmental Working Group hopes that better studies of pets will bring stronger regulations to protect people.